A.R.E. cap from Phoenix Conversions (Knoxville) FB page. You can remove the key from your key fob when valet parking , etc.. . Whoever is parking your car can't get into your glovebox if it is locked and they only have the fob, not your key. I added a keyless entry keypad. I dont consider it a "must have" accessory but there are some times when I like to lock the truck without having to take keys or phone with me. It has to be programmed by the dealership so , in addition to paying for the keypad, I had to pay $100 labor for programming. Installed tablet holders yesterday. Installation instructions were not included so I had to go by the dealership and get them to print instructions out for me. Installation was fairly easy (had to run wire down through the seatbacks and take apart the rear of the center console...). It took me about 2 hours (I'm slow- probably much quicker for someone who is organized). Split the infotainment screen to show nav and music? Thanks! I couldn't figure it out. I did something to my AT4 infotainment screen to have it split to show both audio and nav (each on half the screen). I can't figure out how to make it do this again. I do not have my "infotainment manual" handy. Does any one know how to do this (or have a link to a pdf of the infotainment manual)? This might make a good addition to the "post cool feature discoveries on your T1" thread. If my 2016 sierra had this feature then I never used it. Thanks Erod! I'm going to try that one. That's a great looking truck. I havent seen that color in person yet. What antenna are you using? How is it compared too the stock? I would like to get rid of the tall stock antenna on my new AT4 but not sure what to get. 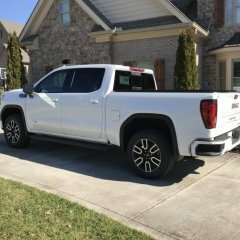 I tried a very short antenna (I forget which brand.. ) on my 2016 Sierra and it got terrible reception so I switched back to the stock antenna on it. 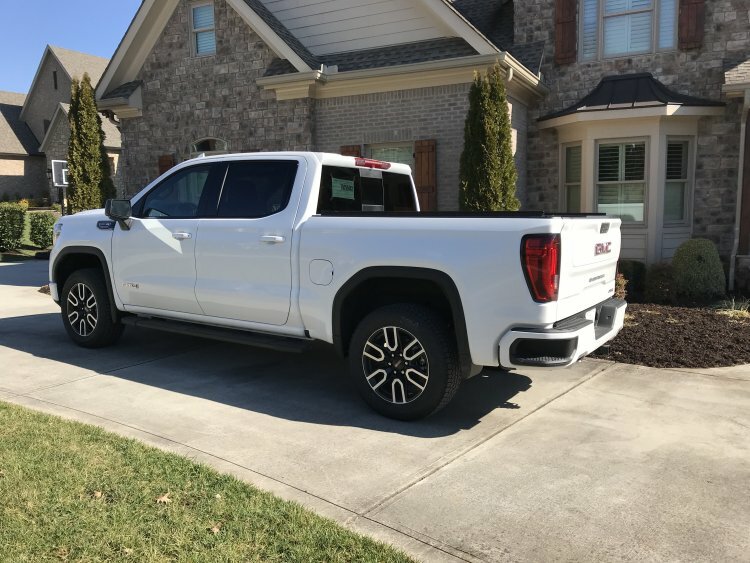 Trade in for my 2016 Sierra Denali (5.3 engine, 22”wheels, power folding steps, 50,000 miles) was 32,750 which was right on KBB value (and more than my local dealer offered...). I didn’t even try to negotiate as I was happy with the overall deal.